LIMA (Reuters) - Peru Attorney General Pedro Chavarry resigned on Tuesday after a public outcry over his handling of the high-profile corruption investigation involving Brazilian builder Odebrecht. His departure from the public prosecutors office marks a fresh victory for President Martin Vizcarra and supporters of his measures to uproot entrenched corruption in one of Latin America's fastest-growing economies. Chavarry prompted widespread scorn and days of street protests after he announced on New Year's Eve that he was removing two lead prosecutors from the Odebrecht inquiry, which has targeted former presidents and presidential candidates. Vizcarra responded by sending Congress legislation to suspend Chavarry and overhaul the prosecutor's office. Chavarry denied he was trying to meddle in the investigation and said he was stepping down to protect the independence of the prosecutor's office, which he portrayed in his resignation letter as under attack by Vizcarra's government. 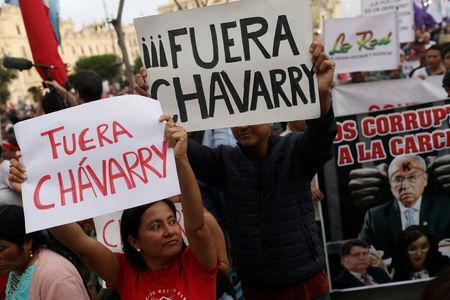 Vizcarra had repeatedly called for Chavarry to step down since he was appointed by a panel of prosecutors in July despite his ties to an alleged criminal group of judges, lawmakers and businessmen. Chavarry was later named by a prosecutor in his office as a suspect in the probe. He denies wrongdoing. A former vice president, Vizcarra has made fighting corruption a focus of his government since taking office last year to replace Pedro Pablo Kuczynski, who stepped down in one of several graft scandals to grip Peru in recent years. Vizcarra, however, lacked the authority to dismiss Chavarry. Under Peru's constitution, only Congress, where Chavarry enjoyed support with the opposition majority, can oust the attorney general. Supreme Prosecutor Zoraida Avalos, one of several prominent prosecutors to call for Chavarry to resign in the past week, was named as acting attorney general on Tuesday. The prosecutors whom Chavarry had dismissed last week -Rafael Vela and Jose Domingo Perez - were reinstated amid the outcry. The two are seen as pivotal figures in the Odebrecht investigation and recently drew up a plea deal that commits the company to providing evidence on about $30 million in bribes it acknowledges it paid to local politicians. In late 2016, Odebrecht acknowledged it had paid millions of dollars in bribes to officials in a dozen countries to secure public works contracts dating back over a decade. The company has committed to paying billions of dollars in fines.